This pink colored TI-30X IIS was manufactured by Kinpo Electronics, Inc. for the office product retailer Staples. 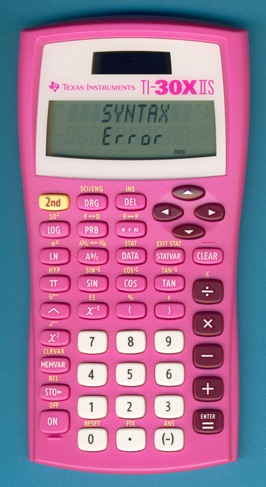 It was released for the Back-to-School 2011 campaign together with its orange sibling and the TI-84 Plus Silver Edition in the colors of pink and blue. Disassembling this model of the TI-30X IIS manufactured February 2011 reveals a well known internal construction. We discovered already in 2004 with Inventec Shanghai, Kinpo Electronics, Inc. and Nam Tai Electronics, Inc. three different contract manufacturers for the TI-30X IIS. Comparing two calculators with datecodes K-0304 and K-0409 yields no significant differences. This design was used in Summer 2011 by five retailers: Office Depot, Staples, Office Max, Fred Meyer and Shopko. In Summer 2012 both Target and BJ's added this TI-30X IIS to their selection. In Summer 2013 six retailers used the design: Best Buy, Fred Meyer, Office Max, Shopko, Staples and Target (in alphabetical order). Don't miss the pink TI-30XS MultiView introduced in 2011, too. © Joerg Woerner, July 31, 2011. No reprints without written permission.